Everyone in Manchester has started a literary magazine. You have too, haven't you? I thought so. This is good if you're a reader or a writer. This is not good if you hate literary magazines. 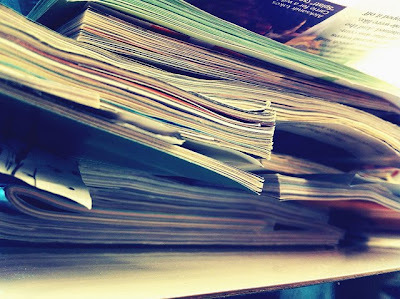 If you hate literary magazines, run along now, this post will bore you. Are they good? Some are fantastic, some aren't. But I like the fact that these writers are getting out there, messing about with words, and giving other writers a way to bring their work to a bigger audience. With some of these online projects the product isn't as important as the concept and the process. And it's interesting to think about how the publishing process itself is changing. When we can set up an online lit mag in an afternoon, and publish at the touch of a button are we losing time that in the days of print would be spent polishing, editing, perfecting? Is the fact that the finished product often isn't actually a product, in any but the most virtual sense, making us bolder (or less painstaking) editors? You can always go back and edit your post, right? By the way, if you're interested in places to read your work or hear people reading theirs, check out this list of live literature hotspots in Manchester I did for Creative Tourist earlier this month. I don't know if you've noticed, but it's 2012 and we still don't have a Manchester listings magazine. Our last one, CityLife, closed in 2005. I was at a Christmas party with a newly arrived BBC staffer who wanted to know where we all found out what was on, and it was interesting to hear five or six Manchester folks who work in the arts share their own cobbled together collection of blogs, newspapers and websites. No easy answer there. Established listings magazine makers continue to snub Manchester, concluding that there is no money to be made from advertising here. And to be fair, they are probably right. But we are getting a new online listings site - Manchester Wire, set up by freelance writer Ruth Allan and my frequent collaborator Chris Horkan, with startup funds from Umbro Industries. I'll link to it here when it goes live. Image by Leigh Jay Hicks (via Flickr). Interesting post Kate. I remember trying to get a Manchester based travel magazine (whuch IMHO had a great title "roam") many moons ago, pre Wanderlust, using an Apple and basic clip art. But funding was a trouble as was the energy of my main 2 collaborators. I await Wire - goof luck! and a paper based City Life type listings mag asap. What happened to Chimp? On other matters do Manchester bloggers have any informal get togethers? I would like to get more connetced with all these wonderful folk! Roam - great title. Funding is always a huge problem. Even for an online-only magazine you generally need way more money than people think, unless everyone involved is willing to work for free and make it their main job... a tall order. Chimp is still going, but it's a bit different than the comprehensive listings magazine I was talking about. And yes, we do have blogmeets from time to time. And it's about time to do one. Thanks for the reminder, I'll post here when we organise one. Thanks for the mention Kate! We're open to submissions for cutaway until the end of February. "I don't know if you've noticed, but it's 2012 and we still don't have a Manchester listings magazine."